RIO DE JANEIRO, BRAZIL – Earlier this month, Brazil’s former transport minister, Alfredo Nascimento, resigned following an article in Veja magazine which exposed alleged irregularities in the granting of contracts within the transport ministry. 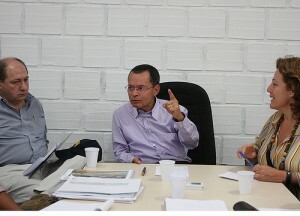 Four days later, on July 11th, president Dilma Rousseff appointed Paulo Sergio Passos – who had been Executive Secretary under Nacimento – in his place. Alfredo Nascimento (left), the former Minister for Transport who resigned this month amid corruption allegations, photo by James Tavares/SECOM/Flickr Creative Commons License. The article in Veja magazine pointed out a number of suspicious transactions. Primarily, it claimed that the ministry had levied bribes of four percent against contractors bidding for ministry business, and that the money had then been channeled into Nascimento’s political party the PR (Partido da República or Republican Party). Nascimento’s 27 year-old son, Gustavo Morais Pereira, is also being investigated by federal prosecutors in connection with the case. Suspicions were raised after the construction company he founded two years ago with a capital of just R$60,000, Forma Construções, increased its worth to over R$50 million – a growth of 86,500 percent. Nascimento’s resignation made him the second minister in Rousseff’s six-month old administration to step down amidst corruption charges, following the Palocci scandal that erupted at the end of May. Some pundits are praising Rousseff for her zero-tolerance approach, seeing the resignations as a sign of her determination to oust the wrong-doers, rein in spending and curb accelerating inflation, while at the same time overhauling Brazil’s drastically strained transport infrastructure. Paulo Sergio Passos, the new Minister for Transport, has a significant task ahead of him, photo by Fotos Gov/Ba/Flickr Creative Commons License. He went on to accuse that, “The current minister has knowledge of everything that went on surrounding this case.” Passos has been influential in the Ministry for Transport since the early 1970s. Passos has a significant task ahead of him in overhauling Brazil’s transport infrastructure to align it with the country’s economic growth. As a result of the dramatic increase in economic activity, the country’s aging highways system and inadequate ports and airports are now seriously over-stretched.